The Sanilac County FFA team enjoyed great success at the State level last month, bringing home several top awards. Five of the team members, who earned accolades at the event, were recognized by Sanilac County Board of Commissioners Tuesday afternoon. We will have a follow-up interview with the five award winners and more on the team’s success in the coming days. 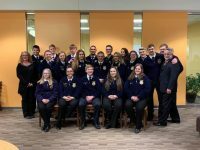 The group is directed by longtime FFA instructor Robert Sollman.